A good anti-virus application can detect viruses. Deleting an infected file that may contain important information is one thing, but restoring the file to its original “healthy” state is entirely another. The Dr.Web anti-virus functions on infected computers; its exceptional resistance to viruses makes it stand out among anti-viruses. There is no need to cure a system prior to installing Dr.Web; this is due to the product’s unique technologies for scanning memory processes and its outstanding ability to neutralize active infections. Dr.Web is immune to any attempts by malicious programs to disrupt its operation. Dr.Web SelfPROtect is the unique anti-virus component that maintains the anti-virus’ security. 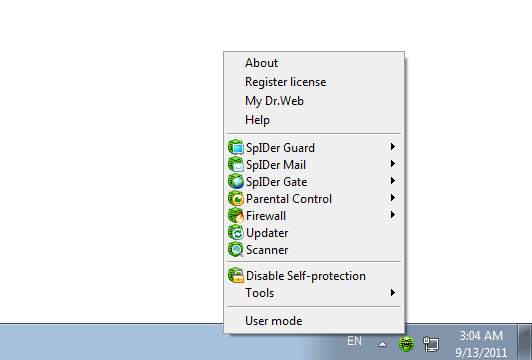 Dr.Web SelfPROtect is implemented as a driver that operates on the lowest system level. The driver can’t be stopped or unloaded without a system reboot. Dr.Web SelfPROtect restricts access to a network, files and folders, certain branches of the Windows Registry and removable data-storage devices on the system driver level and protects the software from anti-antiviruses aiming to disrupt the operation of Dr.Web. Some anti-viruses modify the Windows kernel through intercepting interrupts, changing vector tables or using other undocumented features. This may have a negative impact on the stability of a system and pave new ways for malicious programs to get into a system. At the same time, Dr.Web SelfPROtect maintains security of the anti-virus and doesn’t interfere with routines of the Windows kernel. Scan of archived files at any nesting level. Reliably detects packed objects regardless of whether or not Dr.Web recognizes the compression format and their detailed analysis aimed at exposing hidden threats. Leader in detecting and neutralizing complex rootkits. Intelligent memory scan technologies allow viruses to be blocked in the RAM before replicating themselves to the hard drive, making it less likely for malware to exploit the vulnerability of a third-party application or the operating system. Dr.Web can detect and neutralize viruses that can be found only in RAM and do not exist as files on disks, e.g. Slammer or CodeRed. FLY-CODE is a unique universal decompression technology enabling Dr.Web to unpack data that has been compressed with unknown packers. The cutting-edge, non-signature scan technology Origins Tracing™ ensures the high probability that viruses unknown to Dr.Web will be detected. New! Numerous architecture changes boost the multi-thread scanning capabilities and allow to take the full advantage of multi-processor systems. With full use of multi-core capabilities Dr.Web scanner 7.0 boasts vastly increased performance. In a multiprocessor system the scanning speed is much higher compared with the previous version of Dr.Web. Quick and thorough scanning of RAM, boot sectors, hard drives and removable data-storage devices. Neutralizes viruses, Trojans and other malware. Comprehensive databases for spyware, riskware, adware, hack tools and jokers. The console scanner intended for experienced users enables them to run the anti-virus from the command line. It offers users a wide range of options and also utilizes the multi-core features. Real-time monitoring of the system’s health — interception of all calls to files located on local drives, floppy discs, CD/DVD/ Blue-ray disks, flash-drives, or smart cards. File monitor is highly resistant to attempts by malicious programs to disrupt its operation. Reliable system protection from viruses featuring rootkit-technologies that allow viruses to hide their presence in a compromised system. On-the-fly virus scanning of e-mails over SMTP/POP3/NNTP/IMAP4. New! Scan encrypted SSL-connections (SMTPS/POP3S/IMAP4S). Scanning does not interrupt operation of mail clients and doesn't cause a receipt delay. Individual processing rules for different types of malicious objects — viruses, riskware, adware, hack tools, paid dialers, and jokers. An analysis of message contents and sending time allows the characteristics of malicious activities to be detected and prevents mail worms from carrying out mass mailings. The Dr.Web plug-in for Outlook scans files attached to e-mail messages for viruses, checks the mail arriving via an encrypted SSL connection, filters out spam, detects and neutralizes malicious software and employs the Dr.Web heuristic analyzer for extra protection against unknown viruses. Anti-virus plugins to scan web-pages and files downloaded from the Internet and to check links in e-mails processed by Mozilla Thunderbird without installing Dr.Web. Plug-ins allow you to check web pages before opening them, warn you upon opening external links on Facebook and Google + and check these links, recognize and check short URLs, scans files you download from the Internet for viruses, checks links to scripts and frames. Protects against unauthorized access by a network; prevents data leaks; blocks suspicious connections on package and application layers. The application layer connection control manages the ability of applications and processes to access network resources and registers access attempts in the applications log. The packet layer filtering allows controlling connection to the Internet regardless of an application that uses it. The packet filter log stores information about packets sent over network interfaces. New! In the Game mode a rule dialogue window will appear on top of any application running in the full screen mode. New! Real time monitoring of applications' networking activities and forced disconnection of the application from the network if necessary. With SpIDer Agent you can launch and configure all Dr.Web components. Updating over the Internet, whether automatically or according to a schedule, doesn’t require user interference. Updating can also be launched manually. Updating is very quick even if a slow Internet connection is used. Updating servers are always available. Updates can be retrieved from an HTTP server. To save traffic the anti-virus can be set to update virus databases only However, enabling this option is not recommended. To counter the latest threats, Dr.Web undergoes constant refinement. New features are incorporated in updated modules of an anti-virus package and are downloaded from Doctor Web's server automatically during regular updating sessions. You can also reduce traffic by downloading updates as archived files A special data-compression algorithm used by Doctor Web allows reducing size of downloaded updates. Patch files are used to deliver minor additions and fixes for virus database or program modules. The special compression algorithm applied to such patches dramatically reduces the amount of transferred data. The Doctor Web virus monitoring service collects samples of malicious programs all over the Internet to create antidotes and release updates as soon as analyses are completed — as often as several times per hour. As soon as an update is released, users can retrieve it from several servers located at various points of the globe. To avoid false positives an update is tested over a huge number of uninfected files before it is released. The intelligent system automatically adds entries for similar viruses into the database, ensuring the prompt neutralization of emerging threats. Windows 7/Vista/XP SP2/2000 SP4 + Rollup 1 (32&64 bit systems). Free disk space: ~ 350 MB. Temporary Files created during installation will require additional disk space. Additional 11 MB are required to install the firewall. Additional requirements: Internet connection for registration and updating.